October, as you’ll probably know, is the unofficial ‘silly season’ for IT gatherings in the UK. It’s around this time each year, vendors, exhibition companies and industry bodies go all out competing for the attention of the IT support companies and MSP’s they’d like at their events. This year the team and I decided to join in with the October madness and throw our own event for our partners and suppliers who we regularly call, email, Skype, present to on Hangouts (and generally harass!) but who we rarely get to spend any time with in person. PowerPoint presentations triple-checked, congestion charge paid and the S-MAX loaded up with branded decor, swag bags and roll banners, we hit the M6 towards the big smoke, Canary Wharf and The Museum of London Docklands. 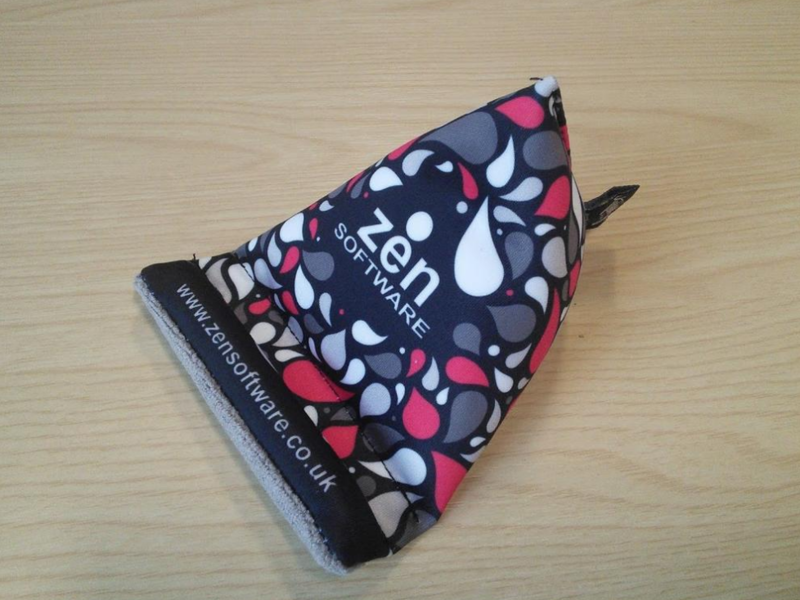 After a minor last-minute trauma getting the now much coveted Zen Software smartphone ‘Toddy wedges’ delivered, the team and vendors arrived bright and early, ready to greet the partners with bacon butties (or veggie equivalent) and tea/coffee. The day’s activities were split between two rooms. In the Wilberforce theatre were presentations by our vendors, Alt-N Technologies, BackupAssist and MailStore, plus two guest speakers, expert industry consultant Richard Tubb, author of The IT Business Owner’s Survival Guide, and Simon Dobson from specialist marketing agency, The IT Marketing Agency. Full presentations from each of the speakers will be available on the blog and YouTube channel next week so keep an eye out for those! Next door was the more relaxed Quayside Room, reserved for networking, lunch, plenty of racing on the 8-lane Scalextric and some highly controversial International foosball action. Towards the end of the day, two very lucky winners walked away with track days worth over £800 each as part of our prize draw. Many congratulations again to both partner program members Stuart from Cambridge Helpdesk and Mandy from Computaccount, we all look forward to seeing you on track soon! It wouldn’t be right not to show you what Stuart and Mandy will be driving so take a look at this YouTube video of the five PalmerSport cars being driven by, well, a mentalist quite frankly. 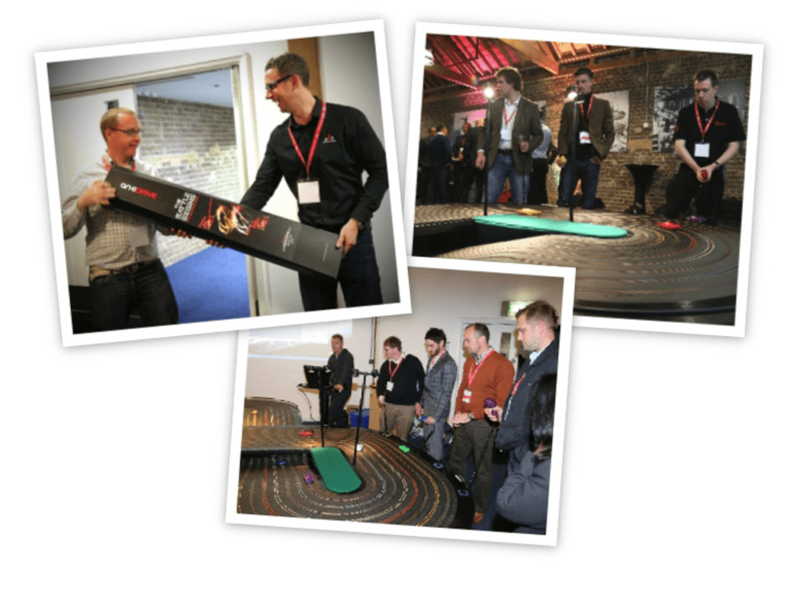 The giant Scalextric proved a real hit on the day, with many partners enjoying the opportunity to take a trip down memory lane, quite a few putting in more laps than I would care to count! Competition was fierce but congratulations to David from DataConnectivity who set the quickest lap time of the day, walking away with a state of the art Anki DRIVE as seen in this episode of The Gadget Show. The official gallery is over on our Google+ page – don’t forget to follow us once you’ve finished having a nosey! It’s been great hearing such good feedback from the event and we can only thank all of you who took time out of your busy schedules to come along and make the day so enjoyable. Thanks of course too to all of the vendors, travelling from as far as Melbourne Australia to come and present, and to make sure they’re at the front line listening to feedback and keeping our partners up to speed on latest developments. Final thanks must go to the incredibly well organised Museum of London Docklands who ensured the day ran like clockwork. If you’re after an event space I can’t recommend the venue or organisers highly enough. 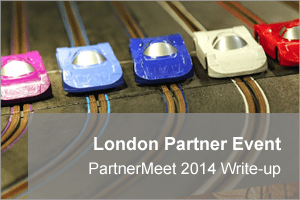 Hope you enjoyed the write-up – see you at an event soon! Fantastic photos and video – I think you’ve really captured how much fun the Zen Partner Meet was to attend! A great location, very well organised and good content for attendees. Thank you for inviting me along to speak, I really enjoyed meeting the Zen Partner community!